Emerald Necklaces Not to Miss Out On! The emerald is a gemstone that is the green variety of the Beryl and is one of the most valuable and famous gemstones in the world. What makes an emerald very expensive is its durability, rarity and colour. Its strength also comes in at 7.5 – 8 on the Mohs scale. When it comes to an emeralds colour, the stone can vary from light green to dark green. The lighter the green colour, the cheaper the gemstone and the darker the gemstone, the more expensive and desirable it is. You may not be aware but a lighter coloured emerald is actually called a “Green Beryl” rather than an emerald. The shade of an emerald is also determined by the presence of vanadium and chromium oxide in the gemstone. It’s important to be aware that that an emerald can be easily fractured and become brittle when handled. This is because the majority of emeralds are highly included, meaning they are quite soft. Historically, emeralds are known for possessing many inner meanings. They hold a lot of power, like improving the wearer’s intelligence and memory, allowing them to think clearly about the past, present and future. The stone is also known to protect lovers from unfaithfulness. An emeralds colour also carries a lot of meaning. The green emerald symbolises new life and represents the start of spring. The gemstone represents the birthstone for May. It also marks a couple’s 29th and 35th wedding anniversary. The emerald is one of the most popular gemstone alongside diamonds, rubies and sapphires. Emeralds have become increasingly popular amongst A-list celebrities. At the recent 2018 Gold Globe Awards, the red carpet was dominated by elegant gowns and beautiful emeralds. Earrings, necklaces, bracelets and rings – many female celebrities were photographed wearing their favourite emerald jewellery. On this occasion the emerald was used as a way to symbolise the suffragette movement that fought women’s right to vote. The piece of jewellery was used to evoke the way in which women should be treated. It was also used as a nod to the power and creativity attributed to females since the dawn of time. The likes of Catherine Zeta-Jones, Debra Messing and Zoe Kravitz were captured wearing their beautiful emerald jewellery. When it comes to emerald necklaces, there are so many different types to choose from. Style, size, setting and price – there are many to pick from so to help you decide we’ve selected the best emerald necklaces so you don’t miss out on them! Take a look a look at our favourites. This emerald necklace makes a truly sophisticated piece of jewellery. The gorgeous green emerald has been cut into a square shape and has been positioned in a 4 prong setting. The emeralds case is made of a sterling silver metal and joins to a sparkling silver attachment, giving you something to loop the chain onto and place this gemstone around your neck. This stunning piece features a dazzling created emerald and cubin zirconia simulated diamond. The dark green emerald has been cut to approximately 10mm wide by 10mm long. The stone has been cut into a square shape and looks very pretty. This created emerald then sits in a prong setting that has been made from a rhodium plated silver metal. What’s great about this metal is that it is very strong, won’t tarnish and is extremely shiny. There are many reasons why we love this necklace. Firstly, the emerald is super sparkly. The emerald is a great stone for capturing and reflecting the daylight. The sterling silver used to create this necklace has been electroplated with platinum which means it will prevent the sterling silver from tarnishing. This also makes the silver very sturdy. As well as the gemstone pendant, this necklace comes with a sterling silver chain. 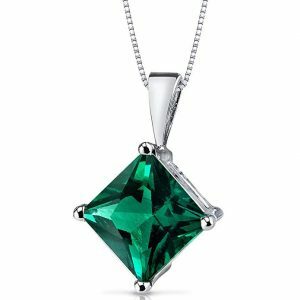 A touch of sparkle has also been added to the pendant in the form of a cubin zirconia diamond which complements the green gemstone beautifully. This adds a touch of glamour to the whole piece and means you won’t be able to take your eyes off it! Sold by ANGG, this stunning necklace will arrive in a cute little jewellery box, keeping your piece of jewellery safe. The necklace is being sold for a low price, making this item a bargain! If you take a closer look at ANGG’s collection of jewellery they simply adore their gemstones and diamonds. This time we opted for a more glamorous pear shaped emerald necklace. This beautiful green emerald has been cut into a pear shape and features shimmering diamonds at the tip of the gemstone. This touch of sparkle added to the emerald gives this necklace some extra glamour. This lovely necklace has been designed using a created emerald which is approximately 1.3inchs wide by 2.6inches long, equating to 10.5 carats. The gemstone is held in place via a 3 prong setting which looks stunning. The piece has been crafted from sterling silver which has an 18k white gold plated finish. The metals surface is anti-oxidation which means it can’t easily be scratched and won’t harm you if you have sensitive skin. When it comes to the style of chain, this necklace features a box chain and includes a spring ring style clasp. The length of the chain is approximately 18 inches, making it a great length. This beautiful piece of jewellery comes in a pretty little purple velvet box that you’ll simple love! The item is being sold by Navachi for a medium price. Looking at their extensive collection online you’ll notice that they simply adore their emerald jewellery. Each piece has been designed and made to the highest quality. The jeweller has done a fantastic job in creating truly unique pieces with the utmost class. If you love gemstones and jewels look no further than this jeweller and their collection! 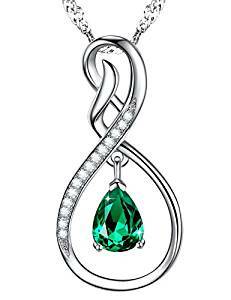 This infinity style necklace shows off its emerald in a simple but enchanting way. 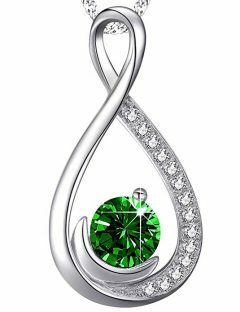 This piece of jewelry has been designed with a striking infinity pendant that includes a small emerald and beautiful clear diamonds. This necklace is very pretty and is the perfect gift to surprise your lady with on her birthday or anniversary. Who wouldn’t want to wear this stunning necklace? The infinity necklace has been created using a sterling silver metal that has been plated with an 18k white gold finish. The design features a smaller green emerald swarovski in a 3 prong setting. The piece also includes 15 clear diamond accent gemstones that look stunning. The pendant is attached to an 18 inch adjustable rolo style chain which finishes off the piece perfectly. This chain includes a lobster claw clasp which makes it very easy to put on and take off. We think this is a very elegant piece for any lady and its unique design will leave you feeling utterly gorgeous. The white gold plated sterling silver also gives this piece that exquisite quality. If you were born in May this would make a lovely birthday gift for the lady in your life. The shiny pendant would dress up any outfit. If you’re more suited to delicate jewelry, you’ll love this piece! There are a number of features that we like about this necklace. The way the necklace incorporates the green emerald and diamonds is extremely unique and desirable. The diamonds have been cut well, are clean and have a great colour to them. Giving someone an infinity necklace is also a great way of showing them how much you love and care for them. The rich green emerald is a classic colour that will suit any women at any age. Overall this necklace has been crafted using a high quality sterling silver with a beautiful deep green emerald and dazzling diamonds. What more could you want? This is another of our favourite square shaped emeralds that has been decorated with shimmering diamonds that complement the emerald beautifully. This necklace has been designed with a 7.10 carat cut green emerald. The stone is a simulated emerald which has been cut into a square shape that is approximately 10mm wide by 14mm in length. The stone is held securely in place by a 4 prong setting. This necklace has been made from a beautiful sterling silver metal that has an 18 inch silver chain and has a spring ring clasp which allows the necklace to be put on and removed easily. 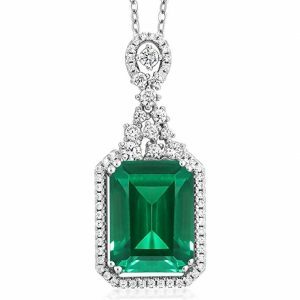 What we love about this necklace are the cubic zirconia diamonds that complement the green emerald and make this piece contain plenty of sparkly. The diamonds are round, white, simulated and look breathtaking when worn. They’re small but perfectly formed and are approximately 1.25mm in length by 1.25mm in width. This is definitely a quality piece of jewellery. As soon as you buy the necklace you simply won’t want to take it off! The design is extremely elegant and has a classy feel to it. This necklace would look beautiful worn if you were going out for a fancy meal on a special occasion like an anniversary or birthday. You can be rest-assured that the gemstones in this necklace have been treated so they keep their durability and appearance. This necklace has been made and sold by GEM STONE KING. The item is being sold for a medium price which makes this piece of jewellery a fantastic price. GEM STONE KING having been making jewellery since 1903. They love creating stunning rings, necklaces, bracelets and earrings. They also love crafting pieces that feature gemstones, pearls, tanzanite’s and diamonds. We love their jewellery because they are beautiful and elegant. Every individual piece is original and unique which is another reason why we love this jeweller. Take a look at their collection, you know you want to! 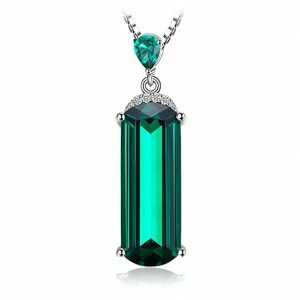 If you’re looking for a daintier necklace then this princess cut emerald pendant may be just what you’ve been looking for. This stunning princess cut gemstone has been positioned in diamond style shape. The size of this emerald stone is approximately 8mm in length by 8mm wide and is 2.2 carats in weight. When it comes to the type of emerald this gemstone is classed as a rich forest green hue color which has a brilliant sparkle. This emerald has been positioned in a solitaire setting which has been made from a 14 carat white gold metal. The gemstone has also been attached to an 18inch sterling silver rhodium finish box style chain. This necklace comes in a signature gift box that will keep your precious necklace safe from any damage. It is being sold by PEORA for a high price. Even though this piece of jewellery is being sold at a high price, this necklace is worth every dollar! PEORA are another jeweller that creates beautiful pieces of jewellery. Gemstones, pearls and diamonds, whatever you like, this jeweller will design and make it for you. Their beautiful collection also consists of stunning pieces including pendants, rings, earrings and bracelets – the list is endless. Enjoy taking a look at their extensive collection. 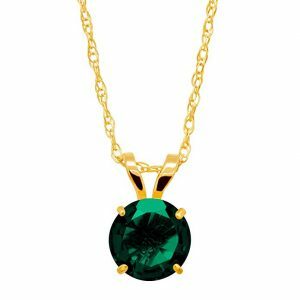 If you like yellow gold jewellery then this emerald necklace may be a great addition to your jewellery collection! This necklace has been created using a dark green emerald that has been cut into a circular shape. The gemstone has been securely held in place by a 4 prong setting and then attached to a yellow gold link. A yellow gold chain is then used to finish off the necklace. This piece of jewelry is a dainty piece that you’ll love. The green emerald is a ¾ carat cut created emerald that has been crafted in a 10k gold setting. The emerald has been cut into a round shape and is approximately 6mm in length by 6mm wide. This pendant also comes with a 10k gold 18 inch rope style chain with a spring ring clasp, making it very easy to put on and take off. This gorgeous piece of jewellery has been made by Finecraft and is being sold for a medium price. This jeweller offers plenty of variety when it comes to jewels including opals, garnets, topaz, emeralds and rubies. Whatever your choice, they’ll make it! This is another of our favourite infinity style necklaces but this time it features a cute little half moon detail in the centre of the necklace. This pretty piece has been created using a stunning sterling silver metal to represent the infinity symbol. One side of the silver metal consists of sparkling white diamonds whereas the other side of the symbol is a smooth shiny plain metal. Within the centre of the infinity shape, the necklace includes a cute little half moon symbol which looks utterly gorgeous. 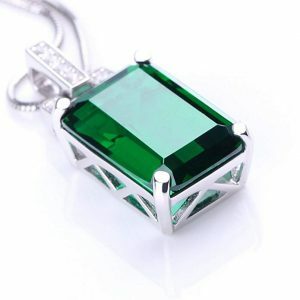 Connected to this you then have a small circular emerald green stone which sparkles perfectly alongside the diamonds. This beautiful pendant is then connected to a simply and elegant chain which completes the piece. This necklace has been crafted using a gorgeous sterling silver metal that has been plated with an 18k white gold finish. 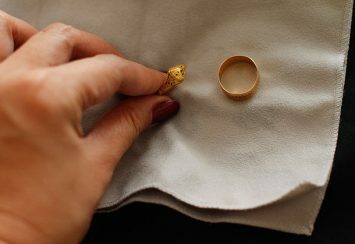 This will make the pendant stronger, will prevent it from tarnishing and will make the piece look very elegant. What more could you want? 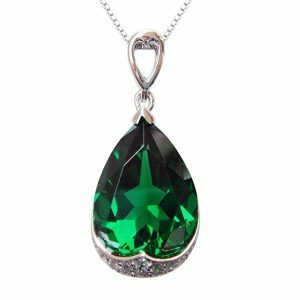 The piece features a high quality round green emerald Swarovski gemstone in the center of the pendant. This has been beautifully positioned in a prong setting onto a half moon charm. The necklace also features AAA sparkle cubic zirconia gemstones which could actually be mistaken for real diamonds. There are a total of 12 clear diamonds that have been set in a row along this pendant. An 18inch rolo style chain has also been beautifully matched with this pendant to finish off the necklace. There are a number of reasons why this necklace is special and unique. Firstly, the infinity necklace design is a symbol that represents your love for someone. This gift would therefore make a lovely present for your wife’s birthday or anniversary. This necklace has been crafted using only the highest quality sterling silver and stones. This infinity style necklace would make the perfect gift for someone who has a May birthday because the emerald gemstone represents the May birthstone. Even though the chain is 18 inches in length the style of chain allows for an extendable 2 inches, giving you extra length if required. The chain also features a lobster clasp allowing it to be opened and closed easily. This infinity necklace has been made by Dorella and is being sold for a medium price. When browsing their collection you’ll notice a common theme being that they like combing gemstones with diamonds and using sterling silver metal. If you like the sound of this combo take a look at their website! This gemstone is a striking centre piece that will look gorgeous on your neck! The elegant necklace features an oval-shaped emerald in the centre of the pendant. This is then surrounded by clear diamonds which have been positioned in two rows, framing the gemstone. What really stands out about the necklace is the deep green emerald in contrast with the shimmering diamonds. You can’t help but be drawn to the stunning diamonds within this necklace. 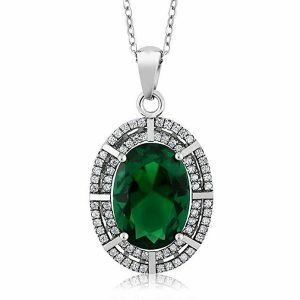 This stunning necklace has been made using a simulated emerald that has been cut into an oval shape which is approximately 14mm long by 10mm wide. The necklace also features cubic zirconia stones that actually look like real diamonds. They are white in color and have been cut into a round shape and are approximately 1mm in length by 1mm in width. As mentioned previously these are positioned in two separate rows, framing the gemstone. This style and layout have a Victorian vibe to mixture with a burst of the 20th century. One of the things we love about this necklace is that it has been created using a solid sterling silver metal. The composition of this metal makes it a very tough and durable necklace so is less likely to get damaged. The necklace has also been designed with an 18 inch sterling silver chain that looks lovely alongside the pendant. An important thing to note is that this is definitely a larger necklace so if you’re looking for a smaller, delicate necklace then this isn’t the piece for you! However if you’re looking for a standout piece that has lots of depth and plenty of sparkle this makes a very elegant piece of jewelry with a brilliant shine to it. The stones featured in the necklace are very big so everyone will be envious of your beautiful necklace! This stunning piece of jewellery is being sold by GEM STONE KING, one of our favourite jewellers. They’re selling this piece for a low to medium price which makes this a fantastic buy! Take a look at their collection now. If you’re looking for a green emerald necklace that is slightly different then this is it! This stunning simulated emerald has been cut to approximately 19mm in length by 7mm wide, making this a more unusual shape. What we love about this emerald stone is that it is of a darker green tone. It has also secured in place by a 4 prong setting. The necklace has been crafted using a solid sterling silver metal with a rhodium plating. This not only makes the sterling silver extremely strong and durable but gives it a bright, shiny and long lasting finish to the necklace! The designer has done a wonderful job in linking the beautiful emerald with the pretty chain and featuring a pear shaped emerald on the necklace. The box style chain has then been carefully looped through this smaller gemstone to finish off the necklace. The chain has been created using a sterling silver metal and is approximately 18 inches in length. There is an important feature to point out when it comes to this necklace. The necklace has been made from a high quality sterling silver metal that has been electroplated with triple rhodium. The thickness of this is around 3 microns which prevents the silver from tarnishing over time. This way you can wear your necklace for years and year to come without having to worry about it aging. Your stunning necklace will arrive in a lovely jewellery box, giving you somewhere to place it when it’s not being worn. This emerald necklace has been made by JewelryPalace and is being sold for a low price. Get your necklace today, you know you want to! To finish off our round up of the best emerald necklaces we thought we’d finish on a high by featuring this gorgeous heart shaped emerald necklace. 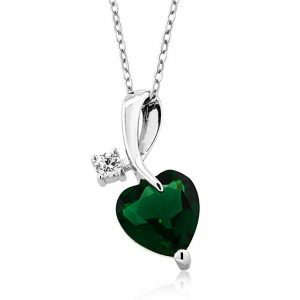 This beautiful piece has been created using a dark green emerald that has been cut into a dainty heart shape. The heart gemstone has then been carefully positioned on a shiny sterling silver metal in a loop shape, with a sparkling diamond on the end. The loop design allows a dainty chain to then be threaded through, finishing off this necklace. There are reasons why we like this necklace. Firstly, the heart shape green emerald equates to around 3.10 carats and is approximately 8mm in diameter. The necklace features cubic zirconia stones which have been cut into a round shape and are approximately 3mm in length by 3mm in width. The green emerald has been held in place by a 3 prong setting, making this precious stone very safe. We love that the necklace has been made using a sterling silver metal, making this necklace strong and very shiny. The overall design of this necklace is very dainty so this piece of jewellery is a lovely piece to wear on an everyday occasion. The heart shaped pendant also has an 18 inch chain which is a great length. The lovely necklace has been made by GEM STONE KING, one of our favorite jewelers who has been making jewelry since 1903. You’ll be shocked to find out that this necklace is being sold for a very low price, so don’t wait too long to buy your necklace now.